I am very excited today to have some stationery queens on Familiar Face (I have looked up to them since Olive & Emerald was just an idea and not a reality). You may know them by the sweet greeting cards they create, their work featured in wedding magazines, or you may not know them at all... 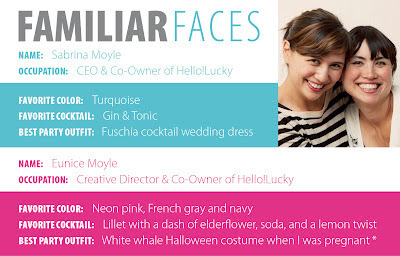 But without further adieu, I'd like you to say hello to the Moyle sisters of Hello!Lucky. I feel like the creative process informs everything I do, from coming up with new product ideas to developing our business. I love coming up with creative ideas and brainstorming with our staff, then seeing the ideas to fruition. I hate bureaucracy and when things are needlessly complicated or slow-paced. The creative process is iterative; it can sometimes take a few tries to get something right, so I like to experiment. Paper pennants. I put some up in my house for my kids' first birthday a year ago, and they're so festive I haven't been able to bring myself to take them down! Impressively optimistic, creative, prone to silliness. I am obsessed with aesthetics (my husband might say to a fault - form often usurps function) and this obsession has definitely influenced me - I am inspired by everything and love exploring new styles, trying to capture the look of old ones and love the challenge of capturing exactly the right style for a particular design project. Tracing paper - the stuff is genius. These ladies must be pretty fun (even Eunice's description of her costume has character), just take a look at their work! I may be overstepping my internet acquaintance boundaries, but I'm pretty sure that Sabrina and Eunice of Hello!Lucky and I could be kindred spirits. More fun coming up in next month's installment! *I made this great white whale costume for Halloween when I was pregnant (my husband was Ahab), it was sort of a cabaret/vaudeville approach - a little sassy fascinator with white "spray" pinned to a blue bob wig, a white whale cut out with sparkly blue suspenders, sparkly blue hotpants, and a navy and white sailor tee, fishnets and little ballet flats. I may have been the only pregnant woman in history to willingly put on a pair of hot pants!